Go to original pattern for design DROPS 116-1. 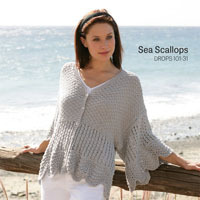 DROPS Jacket in ”Alpaca” and ”Glitter” with 2-colour pattern in round yoke. Size S to XXXL. Long socks in ”Fabel” with the same pattern. We knitted the jacket in black glitter and black alpaca. The picture doesn’t reflect the effect very well, but it gives a really nice shine. 300-350-400-400-450-500 g color no 8903, black. 2 spools for all sizes color no 09, black. DROPS DOUBLE POINTED NEEDLES and CIRCULAR NEEDLE (80 cm / 32’’) size 3 mm/US 2or3 – or size needed to get 24 sts x 32 rows in stockinette st = 10 x 10 cm / 4’’ x 4’’. DROPS DOUBLE POINTED NEEDLES and CIRCULAR NEEDLE (80 cm / 32’’) size 2.5 mm/US 1 – for rib. DROPS Shell buttons w/hole, no 525: 10 pcs. 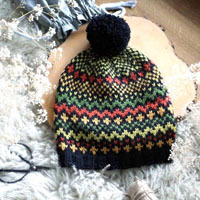 You can get the yarn to make this pattern from	51.70$. Read more. Cast on 314-354-394-434-474-514 sts on circular needle size 2.5 mm / US 1 with 1 thread black Alpaca + 1 thread Glitter. Work rib as follows (first row = RS): 1 edge st in GARTER ST – see above, * K2 / P3 *, repeat from *-* until 3 sts remain, K2, 1 edge st in GARTER ST. Continue like this until piece measures 2 cm / 3/4’’, now dec all P3 to P2 (as seen from RS) = 252-284-316-348-380-412 sts. Continue in rib, K2 / P2, with 1 edge st in garter st each side. 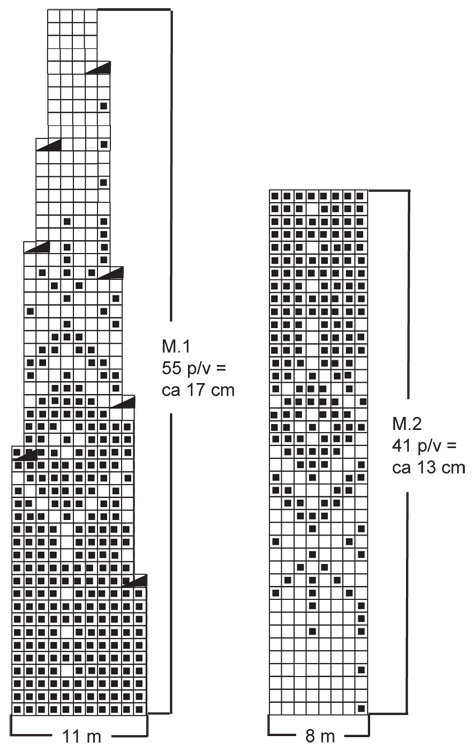 When piece measures 12 cm / 4¾’’ dec all P2 to P1 (as seen from RS) = 190-214-238-262-286-310 sts. 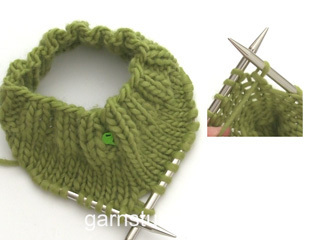 Change to circular needle size 3 mm / US 2or3 and continue in stockinette st. REMEMBER THE GAUGE! When piece measures 40-41-42-43-44-45 cm / 15¾’’-16 1/8’’-16½’’-17’’-17¼’’-17¾’’ work next row as follows from RS: 41-47-54-59-65-71 sts (= front piece), bind off 12 sts for armhole, 84-96-106-120-132-144 sts (= back piece), bind off 12 sts for armhole, 41-47-54-59-65-71 sts (= front piece) = 166-190-214-238-262-286 sts left on needle. SLEEVE: Worked in the round on double pointed needles. Cast on 80-80-80-88-88-88 sts on double pointed needles size 2.5 mm / US 1 with 1 thread black Alpaca + 1 thread Glitter. Work rib, K2 / P2. When piece measures 10 cm / 4’’ dec all P2 to P1 = 60-60-60-66-66-66 sts. Insert a marker at beg of round. 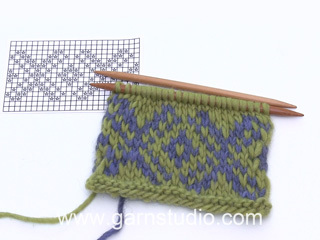 Change to double pointed needles size 3 mm / US 2or3 and continue in stockinette st. When piece measures 11-11-11-14-14-14 cm inc 1 st each side of marker mid under sleeve, repeat the inc on every 4.5-3.5-2.5-2.5-2-2 cm / 1¾”-1¼”-7/8”-7/8”-3/4”-3/4” a total of 8-11-14-13-15-17 times = 76-82-88-92-96-100 sts. When piece measures 48 cm / 19” bind off 12 sts mid under sleeve = 64-70-76-80-84-88 sts left on needle. Put piece aside and knit the other sleeve. YOKE: Slip sleeves on the same circular needle size 3 mm / US 2or3 as body piece where bind off for armhole = 294-330-366-398-430-462 sts. Work 3-5-9-13-15-17 rows stockinette st with black Alpaca + Glitter, AT THE SAME TIME on first row dec 5-8-11-10-9-8 sts evenly = 289-322-355-388-421-454 sts. Now continue in M.1 (first row = RS) with 1 edge st in garter st each side, work the last but 1 st on row like first st in M.1, but without the dec, to make the pattern identical on both front pieces. When all dec are complete there are 107-119-131-143-155-167 sts on needle and piece measures approx 58-60-62-64-66-68 cm / 22¾’’-23 5/8’’-24 3/8’’-25¼’’-26’’-26¾’’. LEFT FRONT BAND: Pick up approx 180 to 212 sts (divisible by 4) inside 1 edge st along left front piece with 1 thread black Alpaca + 1 thread Glitter on circular needle size 2.5 mm. 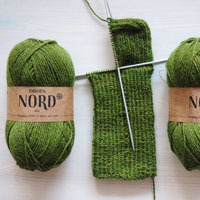 Work rib as follows (first row = WS): 1 edge st in garter st, * P2 / K2 *, repeat from *-* and finish with P2 and 1 edge st in garter st. Continue with K over K and P over P until rib measures 3 cm / 1 1/8’’, bind off loosely. After M.2 piece measures approx 21 cm / 8¼”. Insert a marker at beg of round. Continue in black stockinette st, AT THE SAME TIME dec 1 st each side of marker – SEE DECREASING TIP, and repeat the dec on every 4-5-5 round a total of 16-14-16 times = 56-60-64 sts. 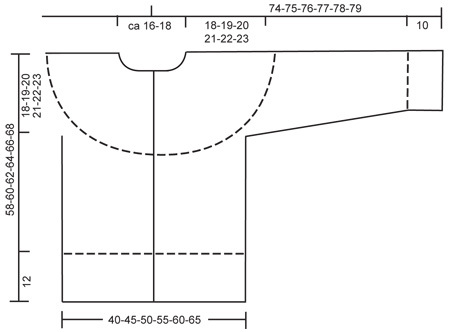 When piece measures 42-44-46 cm / 16½”-17¼”-18” keep the first 28-30-32 sts on needle for heel and slip the remaining 28-30-32 sts on a stitch holder (= mid upper foot). 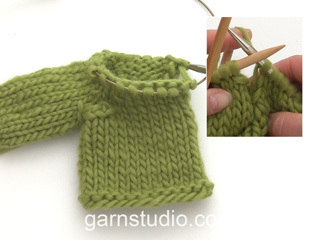 Continue in stockinette st back and forth on heel-sts for 5-5.5-6 cm / 2’’-2¼’’-2 3/8’’ - insert a marker. Now work HEEL DECREASES – see above. After heel dec pick up 13-14-16 sts each side of heel and slip the 28-30-32 sts from stitch holder back on needle = 68-72-80 sts. Insert a marker each side of the 28-30-32 sts on upper foot. Continue in stockinette st in the round, AT THE SAME TIME dec each side as follows: K tog into back of loop the last 2 sts BEFORE first marker on upper foot, and K tog the first 2 sts AFTER the second marker on upper foot. Repeat the dec on every other round a total of 8-8-10 times = 52-56-60 sts. Continue until piece measures 18-19-22 cm / 7”-7½”-8¾” from marker on heel (= approx 4-5-5 cm / 1½”-2”-2” remain). Insert a marker each side with 26-28-30 sts on upper foot and 26-28-30 sts under foot. 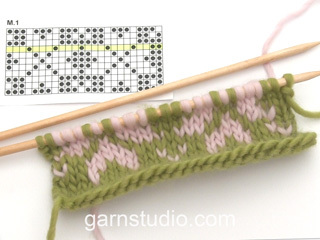 Continue in stockinette st AT THE SAME TIME dec for toes each side of both markers as follows: Before marker: K2 tog. After marker: K2 tog into back of loop. Sock: .... = 88-88-96 sts. Continue in M.2. REMEMBER THE GAUGE! After M.2 piece measures approx 21 cm / 8¼”.